Friday Night Fights: Spy Smashing! Holy abalone, kids, it’s a three-day weekend! You don’t know how bad I’ve been needing this, especially the way the last few months have gone. So heck, let’s jump right into our weekend with some… FRIDAY NIGHT FIGHTS! 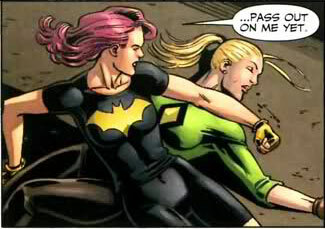 The modern version of Spy Smasher, one of Babs Gordon’s rivals from college, has been trying to take control of the Birds away from Oracle and reckons she now has Barbara right where she wants her. 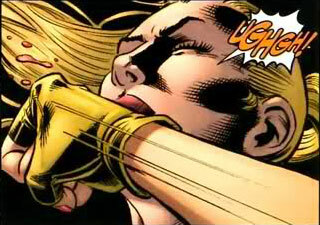 Babs doesn’t have her operatives, she doesn’t have her computers, she doesn’t have her Eskrima sticks, she doesn’t even have her wheelchair. 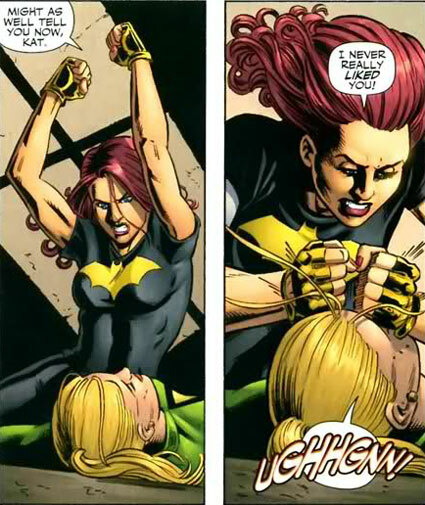 But none of that matters, because Barbara Gordon is one of the DCU’s foremost badasses. There we go, people, if that chunk of righteous pain-bringin’ skull-thumpery can’t get you through a nice three-day weekend, you got problems that not even comic books can solve.